During sleep, your body is hard at work rebuilding at the cellular level. Take advantage of this crucial bio cycle with premium supplements that will enhance muscle size and strength, and aid in fat loss, all while you sleep. Hybrid Sleep contains a high-quality nutrient blend that consists of zinc, magnesium aspartate, and vitamin B6. These three each play unique roles in the recovery process, making this combo from a trusted source the natural secret of many health-conscious performance athletes. Zinc is known to support healthy muscle tissue, while also boosting immune health. It aids in protein synthesis and enhances muscle growth. Magnesium promotes a deeper – and therefore more revitalizing – sleep phase, while also enhancing cardiovascular, bone, and muscle health, and supporting a healthy metabolic rate. Vitamin B6 is a natural energy booster. It is when the three are taken together that they are known to be the most effective for giving performance athletes the most impact for their workouts. Studies show that taking zinc, magnesium, and vitamin B6 together doesn’t just increase strength, it also naturally boosts testosterone levels while training. 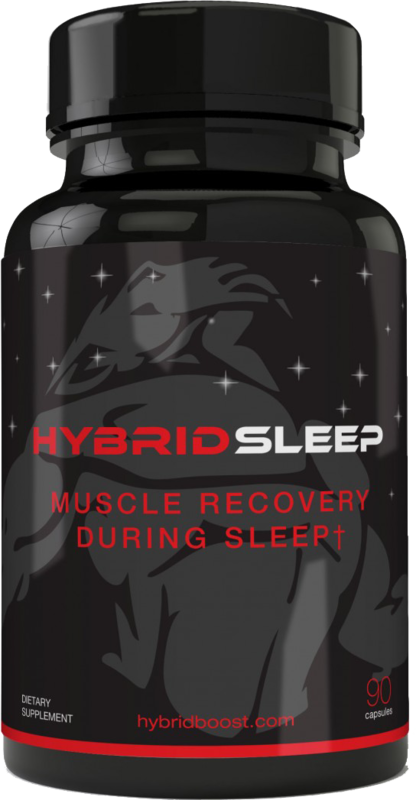 Hybrid Sleep empowers you to gain while you are at rest, the critical time for your body to recover and rebuild. Make the most of your sleep with a high-quality supplement from Hybrid Boost.